Operation Separation is my term for separating commands, think ICommand, that are called in a ViewModel, into a separate Operation class and then having a common service handling the result. This means the operation in a ViewModel does not actually cause the navigation or display of a dialog but merely processes user input and state into a final result to be actioned by the system. This pattern actually takes quite a bit of setup, which is why it was placed into the Exrin framework. If you want to see a full blown example of this pattern implemented, have a look at the Exrin Sample in LoginViewModel.cs. Note: This is an advanced setup and requires a solid knowledge of MVVM, including ICommands. The command is a common helper of the MVVM Pattern, allowing an executable command to be bound to a View from the ViewModel. Having commands in a ViewModel can become difficult to unit test and clutter a ViewModel. Due to this, I create a separate class called to place the operation in. First you will see in the ViewModel that a call to the operation involves two elements, the ViewModelExecute and the Operation. The operation is constructed with the appropriate values it needs to operate, such as the ViewModel state. It will return a result that will determine its final action. This class implements an interface of IOperation, as all operations will do, and returns a function that returns an IList<IResult>. These are all interfaces manually created. You can define these as your project requires. The command and operation are the main components you will need to code for each command you want to implement. 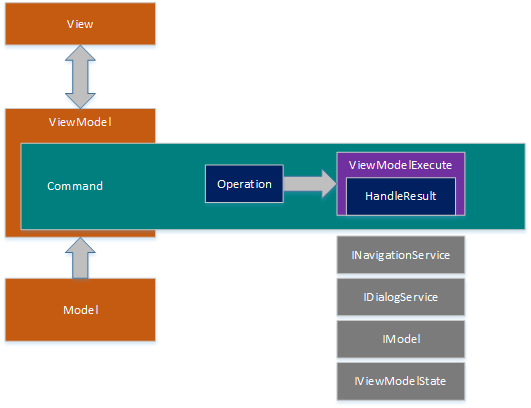 ViewModelExecute is the class that runs the Operation, receives the result and processes it. First we create an Execution object than stores the functions for processing the result. In your Base View Model or another common point, you need to create an instance of this Execution object that handles the result. // Do your navigation here, etc. This is now complete and you can create as many operations and commands needed to run through here. Having a single class responsible for each command in your ViewModel allows the following benefits to happen. In summary, it allows you to write a lot of code you would normally have to write for each command and only write it once.